A.P. Bio is an American 30 minute scripted comedy television series, which kicked off on February 1, 2018, on NBC and is broadcast every Thursday at 20:30. The show is currently in its 2nd season. NBC has officially confirmed the renewal of A.P. Bio for Season 3. The exact release date is yet to be announced so far. Sign up to track it down. 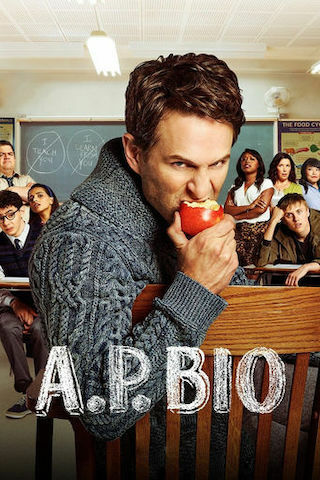 When philosophy scholar Jack Griffin loses out on his dream job and goes to work as a high school Advanced Placement Biology teacher, he makes one thing very clear: he will not be teaching biology. Realizing he has a room full of honor roll students at his disposal, Jack uses his flawed logic to misdirect his principal and recruit the kids to help him mentally break his job-stealing nemesis and win back the position that's rightfully his. After an embarrassing video of himself falling off a stage goes viral, Jack plans a viral video of his own. Meanwhile, Durbin, Helen, and the teachers track down Whitlock's most notorious litterer: the Sugar Daddy.